One question that often comes up concerning Pay-Per-Click (PPC) marketing is, “What is a good CTR?” This is a fair question to ask because CTR pops up so frequently in conversations when diagnosing and optimizing performance, but you should also be careful not to place too much weight on this metric. There are several reasons for this caution. Google’s guidelines are that a good CTR for search is 1% and for display 0.1%. However, these numbers are by no means the measure with which we assess all PPC marketing efforts. People have had success with different CTR numbers. There are stores of people who’ve had better success with an ad that has a CTR of 1% over one that that was much higher. A good CTR will vary from industry to industry. It will also depend on the product or service you’re offering. You might want to do some research to determine what would work for you. 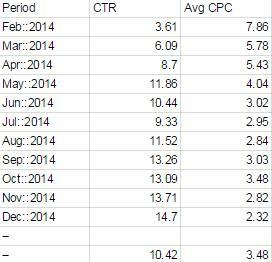 The AdWords account, campaign and ad group structure can affect your CTR performance. A high CTR does not mean very much if you’re not making any money. People might be clicking on your ad, but are not doing anything after they land on your site. This happens with a lot of ads that capture the attention of those that are simply doing research on the Web. A high CTR is nice to look at, but a conversion, especially if it’s a low cost conversion, and a high ROI are even better to have. You want the impressions, but you also want good quality clicks. Evaluate how effective your ad is at initiating a call to action and don’t just stop at looking how high your CTR is. CTRs serve as better indicators of how an ad text is performing. If you want to know which ad performs better out of the two you’re comparing, use each ad’s CTR to determine which ad you should use. If you’re looking to improve your Quality Score (QS), then spend some time working on improving your ad’s CTR. This metric does play a big role in determining your QS. A good QS will help you lower your click costs and will help you get better ad placement. In a nutshell, there is no specific CTR that you can say is good. It will depend on what industry you’re in and what your marketing objectives are. That being said, it’s still important to keep an eye on your CTR when you’re optimizing your ads. It’ll help you determine which ad is doing better when your writing ad copies, and it can help you improve your QS score. Now that we’ve established a warning for placing too much emphasis on CTR, I’d like to share a few insight that you might still have in your head maybe a theory you read somewhere that a higher CTR would translate to a lower CPC and still affect profits, is there any truth to this? so I’d like to show you my very own research and testing. This test is still ongoing but it started a year ago on 5 accounts I manage to compare CTR and CPC. 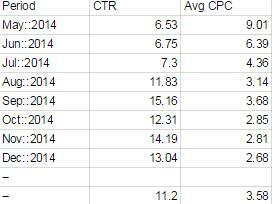 Here’s the data that compares CTR and CPC for 5 Accounts I manage. This first account I optimized the account in April and September of 2014, the goal is to increase the CTR by 2x if at all possible. 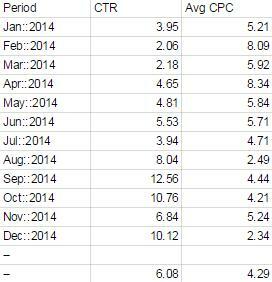 At the end of the Year I was able to increase the CTR by 6x and decrease the Avg CPC by half. The second account is some what similar I did a few tweaks with a similar goal to increase CTR and Lower CPC. 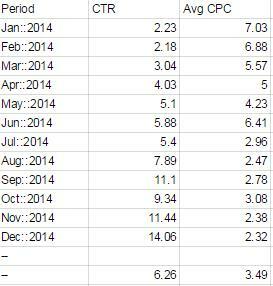 At the end of the year I was able to achieve almost 7x CTR improvement and slash the CPC down to about 1/3. The third account, like the 1st and 2nd account, I had the intention of doing the same thing but we encountered a local competitor that got really aggressive, you can see the ups and down of this account, at the end of the year we managed to improve the CTR by 2x and again, the CPC cut down by half. The fourth account had trouble with CPC the prior year, the client start and stop the account but when we started the client committed to run it continuously and it paid off, using the same strategy I had with the other accounts, I was able to keep the CTR high and we ended up doing really well at the end of the year. 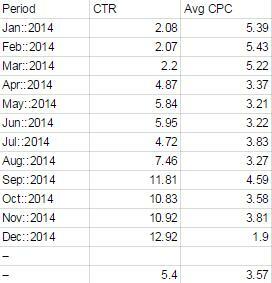 3x improvement on CTR and we cut down the CPC to 1/3 of what it used to cost us in Feb of 2014. The fifth account is a relatively new account in 2014, we started off with an insanely high CPC but using the same optimization strategy, we were able to cut down the cost per click to a 3rd of what it used to be. Keep in mind, we spend about $1000-$2000 for each of these clients each month and they are all in a similar industry. So now, that’s 5 accounts. Does CTR affect CPC and in the end your/your clients bottom line? What do you think? Tell us below. In the near future, I’ll post another article on what I did with the accounts to increase CTR. So be sure to subscribe to our newsletter to get it as soon as it is out.